Full confession: I watched the original WarGames for the first time after finishing the new #WarGames series it inspired. The new Eko interactive series by Her Story‘s Sam Barlow uses some clips from the 1983 movie, as well as some other references to it, so I wanted to be in on the joke, so to speak. After watching it, I don’t think it’s necessary for the enjoyment of the series, but I would still recommend doing so. It’s a fun, campy movie on its own and knowing those references will keep you from feeling like an outsider looking in as you play #WarGames. Now, the show is not technically a game or an app, so you may be wondering why I’m covering it here. But Her Story was one of the best experiences I’ve had with any medium, as it completely messed with my head, so Sam Barlow’s on my radar. And technically, there is an Eko app for iPhone that lets you stream the whole series — a total of six episodes — for free with an ad between each episode. Things can be hard to make out on such a small screen, though, especially since the action takes place over several small windows, never the full screen. I asked Sam Barlow if he thinks there will ever be an Eko app for Apple TV and other streaming devices, and he thinks that’s something we can definitely expect. But until then, I recommend using this link on either an iPad or PC to watch it in a browser. The ads are minimal, but you can also buy the ad-free version on Steam for $2.99 if that’s your jam. The main hook of the show is that it watches you watching it. While there’s sometimes only one window on the screen, usually there’s multiple. 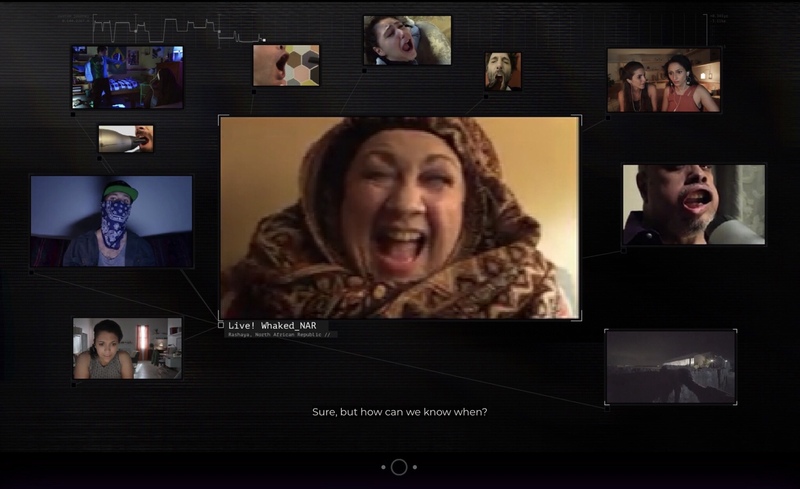 The action plays out as though you’re looking in on video chat from different phones and computers. There’s always one central view with the others floating around it. Usually, each character has their own window, but sometimes you’ll see other things like a website or security camera footage. Technically, you can watch the show like any other, by touching nothing and letting whatever window is in the center stay in the center. But if you want to interact with it and have an experience tailored specifically to your actions, you can tap (or click) on a specific window to pull it into the center. As you do so, a little graph at the top of the screen will keep track of what you do and shape the story around that. It’s subtle and would be pretty hard to crack exactly how to control things, so I don’t recommend trying. #WarGames centers around a young woman named Kelly and her “hacktivist” friends. It starts off with them playing a prank on a celebrity, but they start to get more serious about things when they see Kelly’s decreased mother being called a traitor by the media. The term “fake news” is thankfully left out, but it does touch on how sound bites can be taken out of context to tell a different story than reality. Kelly and the gang set out on a mission to get the true story to the masses and they make it go viral using the hashtag #WarGames. Once they get a taste of this kind of activism, they decide they want to do more and make a bigger difference. I don’t want to spoil the rest of the story for you, so watch it to find out what happens. But I do want to talk more about the unique medium in which the story is told. I think most of the characters exist to reflect back on Kelly and so you might see more of those characters, learn more of their backstories, and through doing that reveal different aspects to Kelly. The way the story revolves is driven very much by how your viewing tweaks Kelly. And often that reflects in who she talks to or how she talks to them. So Kelly is always going to be the focus of the story, but how you watch will affect her friends to a degree, as well. I still don’t know if I’ll watch the whole series again to see what might change, but I did replay part of the last episode because there’s a more obvious “choice” there. I actually kind of regret doing so. I think if you start trying to hack the system and figure out how to get different footage, it can ruin the magic. The show quotes the famous line from the WarGames movie, “The only winning move is not to play.” And I think to some extent that holds true for the Eko technology. Not that you shouldn’t play (or watch) it at all, but that trying to turn it into a game and find the alternate paths could make for a less enjoyable experience and possibly break the immersion. The inception of the show was that it was based on the original movie so part of the process was figuring out what that would mean. I was adamant I didn’t want to do a straight sequel and extend someone else’s stories and characters, so the idea of setting it in a world where the movie exists seemed like an elegant solution. Kelly’s mashing up of pop culture felt like a way of acknowledging the way these movies frequently get rebooted, but she really cares about the heart of that movie and what it represents. Quirk! Really the big experiment here is acknowledging that all shows end up being subjective — but here we make that literal. You all get a genuinely unique version. We spent a lot of time talking about the philosophical implications of restarting or rewinding episodes — it’s a mindtrip. I agree — it is a mind trip! It’s still messing with my head, as I wonder what I didn’t see in my version, but I’m also not someone who’s going to try and figure that out. I’m curious to see audience reaction to it, whether most people will be satisfied with watching it once and accept that as their one and only experience with the show. Or will a lot of people watch it multiple times? I also didn’t have as much of a connection with all the characters as I wanted to, but it is geared more towards a younger audience. Perhaps if I had been drawn to the characters and story the way I was with Her Story, I might have wanted to try and see every bit of footage like I did with the game. It was great to work with an experienced film crew and push the limits of how much we captured and the whole idea of simultaneously capturing different locations. It definitely encouraged me to go further with Telling Lies in terms of the textures of filmed performance, how that works if it’s real-time. Yeah, if Season 1 is a hit, we definitely know where the story is going and have some ideas for further mixing up the formula! I’m super interested in what the future of TV looks like, and whether it looks like WarGames or something completely different, it’s definitely an area I want to play with further! Now, like I said, I don’t think #WarGames will mess with your head the way Her Story did, and the characters might not be quite as compelling. But I still think it’s very much worth watching. Even if you’re not the target audience, it’s pretty trippy to see it in action. It’s also free, so at the very least you should give it a try. There are some meaningful messages told through a diverse cast, and there’s just enough cheesiness that you might actually laugh out loud a few times. In fact, my favorite scene of the series is shown in the screenshot above, and I love that you can’t even tell what’s going on there so it’s not a spoiler. I don’t know if interactive television is the future of entertainment, but I’m certainly willing to go along for the ride and see where it takes us. If you’d like to experience Sam Barlow’s first take on the medium, click this link and let #WarGames watch you watching it.